My favorite novels explore the legacy of families across generations, and how a family history is played out from one generation to the next. 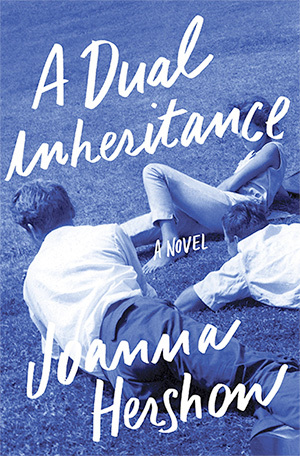 Joanna Herson's new novel, A Dual Inheritance, does all this and more. Beginning in 1963, when two young men first become acquainted during their senior year at Harvard, and throughout the intervening decades until the present, their paths and lives cross in interesting and sometimes heartbreaking ways. The book centers on the somewhat surprising friendship between Ed, a Jewish kid on scholarship who is unapologetically ambitious and girl-crazy, and Hugh, a Boston Brahmin who seems ambivalent about everything except Helen, his first and only love. Their friendship burns brightly and intensely, until one night when something happens which causes it to end just as abruptly. The two men diverge into different paths, but remain connected through and current of relationships unbeknowst to them. Hershon's engaging story deftly examines the contrasting worlds of a rich Boston WASP, and a scrabbling Jewish boy eager to make a name for himself. Her characters are complex and interesting, and provide some rich insight into human relationships and class differences. Thanks to TLC Book Tours for the opportunity to read this very engrossing novel. Buy A Dual Inheritance from Amazon.